Palma Vecchio was born in Serina close to Bergamo but he worked throughout his career in Venice, where he is documented from 1510. His early work reveals the influence of Andrea Previtali, a Bergamo artist with whom he may have studied. Palma’s repertoire focuses on two subjects in particular, the Sacra conversazione and half-length female figures of a sensuous type. The Museo Thyssen-Bornemisza has important examples of both these types of works from the artist’s mature period. 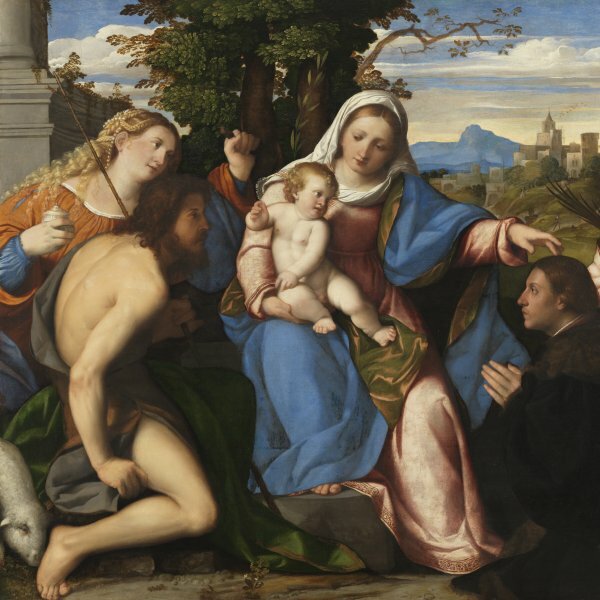 In his discussion of such compositions by Palma, Vasari noted that although not excellent, Palma’s paintings reflected positive concepts as “he frequently depicted the most real and natural part of man”. He particularly praised the artist’s use of colour, which Vasari said he applied “with outstanding grace and order” and in which one appreciated a uniformity and subtleties that exceeded his draughtsmanship. The present canvas, in which the artist combines various elements typical of Venetian Renaissance art, can be considered one of his most beautiful and successful figure compositions. The canvas was in the Sciarra-Colonna collection in Rome where it was attributed to Titian, and it was in fact known in the past as “la bella de Tiziano”. From Rome it passed to the collection of Baron Edmond de Rothschild who installed it in château Ferrières. It remained with the family until 1958 when it was purchased from Baron Guy de Rothschild for the Villa Favorita. Palma locates his sitter in an interior with part of an architectural structure visible at the top right and a simple stepped ledge on which the woman leans. Both elements define the space in which the sitter is located, half-length, turning her head towards the viewer with a fixed gaze. The light precisely models her face and head and the artist creates soft tonalities in the pale flesh of her shoulders, face and hands. This whiteish skin is almost the same tone as the low-necked chemise, forming a contrast with the ample red and blue drapery of her clothing which falls in a mass of folds onto the stone ledge. The two-coloured red and white sleeves are woven with four different and elegant patterns, leading our eye towards the plump, rounded hands which in turn focus our attention on two elements: a small receptacle that seems to contain delicate chains and the woman’s long blonde hair, some of which falls over her shoulder and which she gently catches between her fingers. The model for a figure of this type is derived from Titian and his allegorical compositions. The previous attribution of this canvas to Titian was based on the similarity between this woman and one of the figures in Sacred and Profane Love (Galleria Borghese, Rome). Similar women are to be found in other early works by Titian, such as Lady in Blue (Kunsthistorisches Museum, Vienna) of around 1512–14. These bust-length figures in which the women are shown with low necklines and sensuous poses, expressions and looks, have led critics to suggest that rather than being specific sitters, their forms reflect the contemporary canon of beauty, although they may also be based on famous Venetian courtesans. Some elements in the present work, however, such as the container for the jewels and the fact that this beautiful woman raises her hand to her hair, suggest that the painting might be an allusion to vanity. Another element that suggests this interpretation is the relief in the upper right corner in which a rider tramples on a naked man, an element that has been interpreted as a demonstration of classical taste or as a reference to vanity, among other interpretations. The initials carved on the stone at the lower left corner have not been deciphered to date. 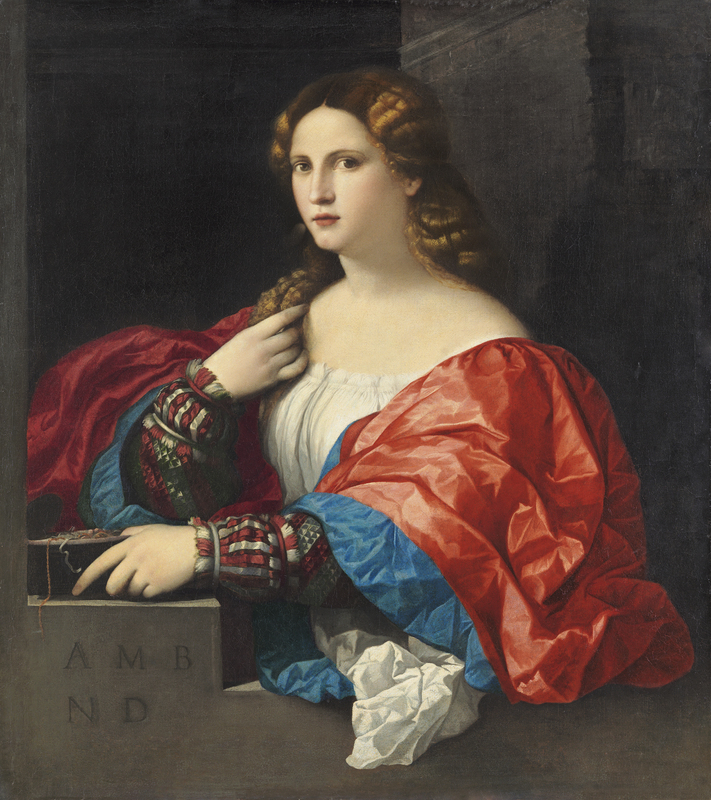 They may offer the key to the painting’s subject or reveal the sitter’s identity. La Bella has been dated to around 1518–20.